"I don't want to get into that." The irritating statement of politicians when asked a tough question they don't want to answer. A $200 fine for "blocking the box." A fine in Virginia Beach for cars who try to beat the light and sit in the intersection waiting to turn left. The four corners of the intersection are blocked with a big X. We should try it on the major intersections in Sioux Falls. Eating out in a restaurant in Virginia Beach will tack a total of 10% sales tax on your total bill. Sales tax is 4% state, 1% local. Localities in Virginia can assess additional sales tax evidenced by the restaurant tax. A novel idea, tax people who eat and drink out. If people can afford to eat out then they can pay an additional sales tax. Groceries taxed at 2%. I guess we are not alone taxing groceries. 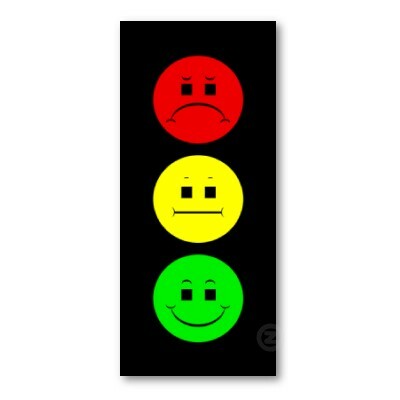 Red light cameras at a lot of intersections but just as controversial in Virginia as SD. Traffic, Traffic Traffic everywhere, any time of the day. Traffic bursts in Sioux Falls that last 30 minutes max. At least the people in Virginia know what it means to merge into traffic when they enter the interstate. No sidewalks, no curbs. They don't care if people have to walk in the streets. Snow paralyzes everything in Virginia Beach. Even the threat of snow closes schools. It has to be a raging blizzard to close down Sioux Falls. No swearing signs on each street corner down at the "Beach." Local officials are trying to promote a family environment experience at the "Beach." A simple 8 oz. sirloin costs $26 and a pound of plump steamed shrimp costs $9.95. Beef in Virginia just does not taste the same as beef in SD. Movies that only cost $5 during the day, not just the early first movie. Navy fighter jets in the sky day and night. A gallon of gas inching close to $3.50. Fresh organic market that makes the most delicious take-out food for those of us that don't cook. American history experiences. Williamsburg, Jamestown, Yorktown within a few minutes driving. Huge Navy presence. 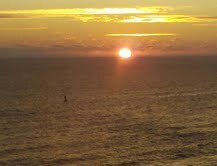 Navy ships and submarine sightings abound out on the ocean horizon. No cars with faulty exhausts, crushed bumpers, windows or tail lights covered in plastic because every car must be state inspected once a year or face a fine. Pulled pork barbecue with cole slaw on a bun. Hatteras Clam Chowder, She Crab Soup, oyster stew, crab cakes, stuffed flounder with crab, hush puppies, steamed shrimp. Normal restaurant eating here. License plates from all the country. Water everywhere you look - ocean, intercoastal waterway, Chesapeake Bay, inlets, canals, rivers. Bridges over water instead of railroad tracks. Bridges that go up to let big boats pass through. Tunnels under the water for boats to pass over. A 17 mile bridge across Chesapeake Bay to the Eastern Shore of Virginia that entails 3 underwater tunnels for the tanker and Navy ship channels. A feeling of being unsafe after dark. Instead of KELOLAND TV - 10 On Your Side, WavyTV. Instead of Crimestoppers - Lock U Up. Local high schools sports do not dominate the local news program, neither does weather. A Prime Outlet Mall in Williamsburg that entails 4 different outdoor malls. A true shopping experience where you park your car and walk instead of parking right in front of a store. Chickahominy House in Williamsburg that gives you a plantation style eating experience. Chicken and Dumplings, Miss Melinda's Special, ham biscuits, buttermilk pie. Big dogs running free on the beach. Surfers trying to catch the next big wave. A furniture store called "The Dump." Six lanes of highway, 3 turn lanes at intersections. 55 mph or 60 mph speed limits that are totally ignored. If you are not traveling at least 10 miles or more over the speed limit, you are a traffic obstruction. Springtime lush with blooming azalea bushes, camelias, and wisteria. They are in full bloom in March/April. The sound of the ocean instead of the winter wind. The wonderful invention of skype to stay in touch when away from home. I got all excited when I saw that the mayor was going to outline his top 10 big wins since taking office. He started by saying he was doing this to counter all the negatives the past week. I think you should shout out your accomplishments because you are proud of them, not to counter negatives heard out and about, whatever that means. I was looking forward to the top 10 big achievements in 2010. I thought he was going to talk about the progress/achievements towards his first term priorities. The mayor said he wanted to do something different. OK, so he pretended to take a page from Letterman and present his top 10. His presentation may be different but I can tell you that what he has outlined is called goal setting and accomplishments. Goals and Objectives are supposed to be specific. City departments have been doing goal/objective setting and outlining their accomplishments long before Mayor Huether entered city government from his corporate world. He acts like he has created something new. Sorry, the presentation may be a little different, but the identification of accomplishments has been done before. After all, isn't that what good government is all about, mayor? I even recognize some of those same city department accomplishments from the past. He's flattered that all the TV stations were at his news conference.They aren't there because of him. They are there because they are covering the news. That's their job. They are reporters. Why is it always about him? Why is it that when I listen to him I don't feel his sincerity? I like to hear a mayor recognize and praise city employees. Like he said, the ones in the "muck" of things. Without them, he is nothing. He says that, but I don't feel his love and admiration, I don't. Words are words and he has a lot of them. I get this feeling of a sense of superiority from him. His presentations are full of socially acceptable phrases to describe his relationships or feelings towards others but it doesn't feel real to me. He comes across to me as someone who feels he is better than anyone else. He got to #8 - Not afraid to tackle tough issues. Those tough issues have been tackled before. It's not like he is just now tackling them for the first time in city government. Good grief. I am not interested in his tackling tough issues. He is supposed to tackle tough issues. That's his job. I am interested in results regarding those tough issues. Give me a list of the top ten actual and specific results and then maybe I can get excited about the mini-Letterman impression. Top Ten # 2 - City government embraces business acumen and becomes more productive. This is humorous if it were not sad at the people carnage in 2010. He said they need to think out of the box, that they are not satisfied with the status quo. I agree, good concepts. Is he saying past administrations didn't embrace a business acumen and he has just brought that concept in to city government. That is at the height of arrogance. Then he said employees weren't satisfied. He said he wanted to surround himself with leaders that have the same energy, vibrant spirit, same focus on making things more accountable, more efficient, more productive on this journey with him. I guess we know which departments heads didn't fit that bill, don't we? Six department heads down. Notice anything they all have in common? Now we get to the big one - #1 - Greater value with taxpayer dollars. The mayor recognized former mayor Dave Munson and his 12 department heads. He said those 12 department heads before him laid the foundation, maintained quality.... Well, not all 12 department heads, I guess. First he praises other administrations and then he makes it sound like the previous administration didn't take care of the basics. Please mayor, taking credit for not spending reserves and returning money to the budget in 2010? Been done before, really. How do you think the reserve fund has grown over the years? You didn't do something extraordinary in 2010. The departments worked hard that year, just like they did in past years, to return money to the general fund and build the reserve fund. Nothing new here, believe me. At the end of each fiscal year, the department heads have always summarized their accomplishments against their goals and objectives. It's a good business practice, whether you are in corporate America or in city government. All that was done in this press conference was a grandstand and a play on Letterman's top 10 idea. It would have had more impact if it had lasted a couple minutes with specific achievements instead of 20 minutes filled with lofty words and no specifics. Short, succinct, specific. Words to live by next time. I don't know who Tom Savage is but the KELO interview with the South Dakota native was interesting. Here is an NBA consultant who seems to get the importance of building an event center downtown and why. Planning and building an event center is a major economic project that will impact this area for 50 years to come. Even the mayor said that very thing earlier this week when he announced the selection of his construction at risk manager. It is hard to understand why the mayor continues to pursue building an event center in an area that is not the economic engine for the future of this city. Picking the Arena site is the easy way solution to trying to get it done. The mayor says he is a strong advocate for "Downtown." Yet, he continues to pursue a venue for the biggest project this city will ever undertake in an area that has seen no real economic development in spite of building the Arena and a Convention Center there. There are 3 camps of thoughts in this community. The camp of absolutely No to an event center, period. The camp of the Arena/Convention Center site, and the camp of Downtown. I think Downtown is getting a bad rap. First of all, people who never go downtown view downtown as narrow streets with expensive shops for the "elite." For all you naysayers of "downtown," think in terms of the Falls area of Sioux Falls. There is more to "downtown" than Phillips and Main. The article in the ARGUS LEADER regarding Councilor Jamison's Plan B alternative was interesting in that the consensus from viewers seemed to be to look at all alternatives. All of the comments were insightful. I actually think Jamison's Plan B has merit. Why not build a convention center in the Falls area of Sioux Falls as well. Dave Syverson hit it on the head with his comments. He is right when he says the Arena site is not pedestrian friendly. People who go to conventions like the idea that they can walk to shopping and restaurant venues without having to take a taxi. Where can you walk to at the Arena/Convention Center? Ever wonder why the Convention Center sits empty the majority of the time? This idea that people will drive in and drive out after an event so it needs to be near the interstate is an idea that is the death to the economic health of any city. I wish the mayor would adopt the slogan, "Laying the foundation for building the future." What future? The economic future that will impact this city for 50 years or more. The Falls area of Sioux Falls is the heart of this city. It is the foundation of this city. The city has already invested in this area with the total redevelopment of Falls Park, Phillips to the Falls and continues with the River Greenway Master Plan. The future has already begun in the city's heart. The excitement of seeing the possibilities is in the investment already made there by people who get the concept of economic development and stability for this city and took the investment leap to start building the foundation for the future. They are not building at the Arena/Convention Center area. Shops and restaurants are not locating in that area. Come on Mayor. You are the leader of this city. Changing your mind is not the sign of a weak man. The strength of a leader lies in one's ability to continue to study and entertain all possibilities and the guts to change direction when the facts presented to you indicate a change of direction. Laying the foundation for the future is in the heart of this city. It is the Falls area of Sioux Falls. Kristi's latest comments on KELO-TV are amusing. I don't fault her for taking advantage of the government sponsored health plan. Everyone who is employed by a company offering health care coverage usually takes advantage of these plans. How nice for her that she is now a federal employee and enjoys the opportunities of affordable health care when there are millions of "everyday people" who can't afford heath care or wouldn't be able to get health care coverage without this health care bill. However, she doesn't seem to get the hypocrisy of her stand on repealing the health care law for all Americans. First of all the House voting to repeal the health care bill was meaningless and pure grandstanding. She said her vote was to fulfill a campaign promise to SD voters. A meaningless campaign promise. Thank you, Kristi, for the grand and meaningless gesture. Now that the Republicans took care of their meaningless attempt to repeal the health care law, they are finally ready to get down to the real business of changing the law. "People with pre-existing conditions, finding solutions to get them covered with health insurance. Allowing children to stay on their parents' policies until they're of age 26. Those will all be solutions that you'll see Republicans bringing forward," Noem said. News flash, Kristi. Those provisions are in the health care law that you were so intent on repealing. Those solutions are done, no thanks to you. Watching dawn awakening across the horizon is one beautiful sight. If you haven't experienced it, you should put it on your bucket list. I got up the other morning and looked outside and it was a marvelous sense of beginnings. 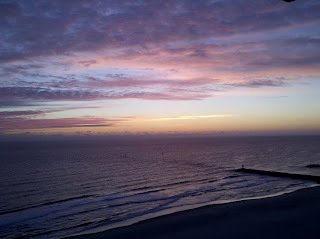 Pink skies, a hint of something extraordinary happening against the clouds. 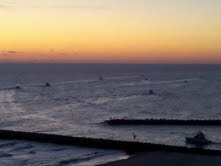 Then, the exodus of fishing boats leaving Rudee Inlet and speeding off to the south to catch the "catch of the day." One after another, over 31 in all. I wonder if they pay attention to the beginning of their day or are they just intent on finding their special fishing spot. Skies the color of greys, pinks, and yellow. Clouds in the horizon that look like mountains. A hint of blue skies against a warm glow off the horizon. It is a peek at earth waking itself up from slumber. All those Navy ships, tankers, gliding smoothly across the Atlantic Ocean, moving away from the coastline into the dawning in the east. 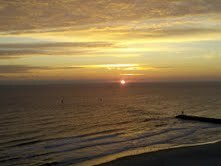 Living on the oceanfront is a wonderful experience. The view is never tiring. The waves, big and small, crashing onto the beach. People walking, dogs running free in the winter season, people searching for metals and some people just standing at the waterline staring out into the vast ocean engulfed in their own thoughts. Peaceful! Dawn is truly the miracle of the universe and life itself. Now we have study that tells us a woman's tears are a turnoff to men. Men don't find crying women sexually attractive. I don't believe that is new news, is it? Maybe I have not known the right men, but I don't recall any men I know that are comfortable around a woman in tears. I have to admit, that I hated it when someone cried in my office, man or woman. It seemed to me that those tears were used as a tool to be manipulative in a serious situation which was confronting them. I handed them a box of tissues and stayed silent until they were done crying. That's not to say I don't have a heart. Really, I do have a heart and can be as sentimental as the next person. However, I think I can tell the difference between real tears and tears used to elicit undeserved sympathy or a way to get out of something. I can boo hoo with the best of them at a sentimental movie, when I say goodbye to the ones I love, when I see something that moves me emotionally. It is interesting to listen to men respond to House Speaker Boehner's crying and choked up behavior. They don't like it. Actually, they are pretty vocal about not liking it. I, on the other hand, am kind of fascinated by it. Yes, it has made me feel uncomfortable at times but I don't think his crying or choked up responses indicate he is a weak man. He is an emotional man, no doubt about it. Are his tears sincere? I think so. Who knows. Does it make him a weak man? I don't think so considering the fact that I can still see and hear him shouting on the House floor when he was talking about health care reform. He is just a weepy, emotional man when it comes to his personal self. Can you imagine what people would say if Nancy Pelosi cried Bohener boo hoos? Weak woman, emotionally unstable, not fit for a leadership position. I don't care what anyone says about gender equality. People still view men and women differently when it comes to the boo hoo category. I can't wait for the study on men tears. They have a good subject in which to test, our own House Speaker. In the meantime, I think I will just go off in a corner and cry some silent crocodile tears so as not to offend someone. Sniffle, Sniffle. I encourage comments on my opinions. That is the fun side of writing a blog. It is always interesting to read concurring or differing opinions on a subject I write about in a blog. I don't care if someone disagrees with me. I don't even care if you give your name or write anonymously. I like a good argument. What I am not going to allow on my blog is for some anonymous person to write personal attacks, whether it is about me or person(s) that may be the subject of my blog. Take notice you anonymous people who think it is OK to write personal attack comments that have no relevance to the topic at hand. Bullies do not get to participate freely and anonymously on Jennifer's Musings. The delete button is the option of the writer and I intend to use it when people misbehave on my blog and do not adhere to my standard of civilized conduct. I am very sad to learn Sally Felix is leaving the city as the Director of Library Services. Sally came to the city with excellent credentials and a vast amount of experience in managing and leading library service operations on the East Coast. She has made a huge impact during her short tenure as director of Siouxland Libraries. Felix oversaw a main library in downtown Sioux Falls, 3 branch libraries, eight library locations in Minnehaha County, a bookmobile service and outreach services to nursing homes and daycare centers. Her leadership in designing and overseeing the construction of the Oakview Branch and the complete renovation of a main library originally constructed in 1970 was nothing short of phenomenal. Operationally, visits, items borrowed, computer access and uses, new library users, and people attending programs have all increased substantially under Sally Felix's leadership and direction. She lead the planning, construction phase and grand opening of the Oakview Branch and the complete remodel of the Main Library. She has been instrumental in hiring some exceptional people and developed an organization totally committed to providing excellent, responsive customer service. Mayor Munson often spoke of the importance of libraries to our community, to our children, and to the quality of life and was a strong advocate of the library system and Sally Felix. I remember when our exhaustive search of almost nine months found Sally and how excited we both were that she was interested in coming to South Dakota from Pennsylvania to lead the library organization through some very important construction and expansion phases. Mayor Munson understood and recognized her contributions and expertise in the library field and always made comment on how lucky we were to have found her. Sally Felix's leaving the City of Sioux Falls and the library system is a huge loss to this community. She is leaving way too soon. I had hopes she would be here much longer than the short 7 years. I hope Mayor Huether understands the significance of what she has brought to the library system, this community and to the organization. He will not find a more dedicated public servant than Sally Felix. It is a tremendous loss for the city as an organization, her staff, and to the community as a whole. I remain optimistic about the new House Speaker, John Boehner, Republican from Ohio. I will remain so until he disappoints me or let's the Tea Partiers take over his mentality and leadership. This country needs calm, constructive leadership. He comes from a background that is not privileged and has worked hard to improve his place in America, like other average Americans. Ohio is state that has many challenges and he is obviously loved and respected to be re-elected time and again. Hopefully he will earn the respect of all Americans across this country as well. His acceptance speech when sworn in as House Speaker was not partisan. He said, "the people voted to end business as usual and today we begin to carry out their wishes." I fervently hope these are not empty words. He also said "this is the people's House" and vowed to "give this government back to the American people." I hope he is not just talking about the Republican American people. However, he needs to get over the mindset that he can't tell other Republicans "what to think." He is the House Speaker, the leader of the majority party in the House of Representatives. He needs to lead his party in a responsible manner. When asked about the President's birth and citizen eligibility, he stated that the state of Hawaii says the President was born there and that was good enough for him. I just wish he would be more forceful with all those right wing fringe believers in his party that defy common sense. The fringe lunatics are a danger to our society and will work to disrupt the business in the people's House. He needs to work hard to minimize their rhetoric in the Republican politics. While he is at it, he might want to counsel Senator Mitch McConnell, R-KY on a more bi-partisan approach to conducting the people's business in the future. His response to the tragedy in Arizona this past weekend was respectful and non-partisan. The decision to suspend legislative action this week was the right thing to do. So, I say, stand back, watch and wait with optimism that something new and cooperative will happen in Congress in 2011. Please don't disappoint us, Speaker Boehner. Like the Cookie Monster who has a voracious appetite for cookies, it looks like the mayor is going to have a voracious appetite for more money to complete his vision. $500,000 was budgeted and approved by the city council to study the mayor's concept and to begin designing the event center. As reported by the ARGUS LEADER, the mayor told the city council earlier this week that he might need more money. I thought the $500,000 was to pay for the design process, the hiring of an architectural firm, a construction manager at risk, a comparative analysis of sites and an economic analysis. Has this first $500,000 project been completed yet...where's the analysis of sites and economic analysis? Let's see where this $500,000 has gone first before we start asking for money. Tell us what has been spent to date and what is left. I suggest the city finish the $500,000 project first before they start asking for money to travel and for hiring "legal experts" to study naming rights. Kind of jumping the gun, in my opinion. Me want cookie. Me want cookie. Om nom, nom, nom. I, like millions of other Americans, have been riveted to the TV over the past few days watching the unspeakable tragedy in Tucson. As shots rang out by another deranged person, many people fell wounded and dying on an asphalt parking lot. We constantly ask why such terrible things have to happen to innocent people and then we immediately look to place blame. I have to admit that I felt a kinship to what the Arizona Sheriff said that first day. We have become an ugly and uncivil society with our speech and actions when dealing with the government and elected officials. Blogs and the Internet are filled with the most hateful comments about people. I turned off the news reports when the blame game started once again. All that rhetoric was taking away the significance of the loss of life and heartbreak that so many families were going through as they mourned the loss of their loved ones or prayed fervently for the life of their loved ones. In this unspeakable event, I did not want to hear about some one's right to bear arms. I did not want to hear about some one's political mumble jumble. I felt sorrow and wanted to focus my attention on praying for all those people impacted by one mentally deranged man who felt he needed to kill someone in order to set his world right. Be quiet America and somberly listen to the heroism of ordinary people and the love families feel for the ones they lost. In a couple of weeks, all this vitriolic language and actions will resurface anyway and people will soon forget this unspeakable tragedy perpetrated on the citizens of Arizona. Their lives will never be the same again. For the rest of us, we will just go back to our awful uncivil behaviors like it never happened. I wish that wasn't true, but unfortunately it is human nature. Whose Backbone is Beck Talking About? The city needs to get a backbone says Mr. Beck of the ARGUS LEADER. What is the man talking about? There is plenty of backbone in this town. I guess because all the people who have commented on this project or have strong feelings about this project don't count and are getting in the way of progress as Beck sees it. If the Event Center issue left the rails, it is the Mayor's responsibility to put it firmly back on the rails. Yes, to his credit, the mayor brought this issue to the forefront of debate. I have yet to hear how he intends to pay for this idea though. It is still this vague notion of bonding, general fund and private money. The public wants to know that and the taxpayers won't go back on the rails until they know how it is going to be paid for and how it will impact their taxes. If his idea is so great he should have everyone falling in line with his vision. There are many people in this community who don't support his vision. The social media campaign led by someone who never showed much interest in the city until now is the most stupid comment I have heard to date. Instead of talking about the issue, just insult the individual. You insult by inference so let's name him, Steve Hildebrand. He lives in this community and is involved in this 'social media campaign' you insult. What does one's interest before now have anything to do with expressing one's opinion. Guess what, Mr. Beck, every man, woman and child's idea is the American way. It is called a democracy. It is not always pretty but it is the most effective. The voters have the final say. This is not a dictatorship. That social media campaign you so easily dismiss is made up of competent, responsible thinking people in this community who happen to believe in an Event Center the same as you do. So just because they don't agree with your position they are wrong and insignificant? It is the mayor's job to work through the rhetoric, listen to all sides and work towards an agenda that makes economic sense to the taxpayers. This project is not an addition or remodel project. This is an issue that will impact the economic climate and stability for this community for decades. I am sorry you don't like this debate. Big deal - it's not about you or your backbone. It's about what is good for this city. I dislike the term "Obamacare" because it is used as a derogatory term to malign and disrespect the President. I admit I don't know all there is to know about the health care law, nor have I read the law. Like most Americans, I get my news about the health care law from television and print news. What I do know is there are a lot of people who don't have the ability to get health care coverage. I have relatives and friends who are self employed or work for small companies who don't offer health benefits. For the majority of them, cost isn't the reason they don't have health coverage, it is because they have a pre-existing condition that precludes them from obtaining coverage. Two of them are cancer survivors. Private insurance companies are not the least bit interested in giving them coverage, or they make the cost so high it is not even remotely affordable. The passage of the health care law has afforded them the ability to get health insurance coverage at a cost they can reasonably afford. When the Republicans talk about repealing the health care law, I have to ask why? Why can't they take the law and improve the areas that are objectionable and leave the areas of the law that make sense, like no pre-existing conditions, coverage for children up to age 26 while in college, wellness benefits, medicare prescription drug benefit changes for social security recipients, for example. Dismantling health care reform is not the answer and once again, I am left to think that Republicans don't know the middle class or care about the middle class or the disadvantaged people who struggle day by day to just survive and feed their children and provide them a roof over their heads. It is a travesty that in this country a family can be destroyed financially by a catastrophic health event in their lives because they cannot get reasonable health insurance coverage. When the non-partisan Congressional budget office concluded that repealing the health care law would drive up federal deficits by $230 billion by 2021, what was the response of the House Republican leaders? They dismissed the new projections as unrealistic. This is an agency which both parties in Congress have historically relied on and which is considered an independent source of information about pending legislation. In addition health care analysts say overturning this law will leave 32 million Americans without health coverage. Democrats have said that they are willing to make adjustments to the health care law. I know that business says this will cost them money and will move them to make the decision to drop such benefits for their employees. Congress needs to address the concerns of business. Congressional members have excellent health insurance benefits for themselves and their families. I just wish the Republicans would be willing to work for all Americans and realize that having a mentality of "it's my way or the highway" leaves a lot of people feeling disenfranchised by their positions on this subject. Don't repeal health care, just work together to reform health care for the benefit of all Americans. Why is that so hard? Congratulations to the City for getting it right on the appointment of Tracy Turbak for Director of Finance. He is an excellent choice and brings competence and experience that will make him a valuable member of the executive team. Smart man! I worked with Tracy through the SD Municipal League was always impressed with his insight, knowledge and leadership. The city is lucky to get him. He will hit the ground running when he starts in Febuary. Joe Batcheller hit it on the head in his My Voices article. This is a good economic development project for the Director of Community Development/Public Parking Facilities. These parking policies are under the direct administration and supervision of the director and he can play a significant role in driving this agenda with his parking board and Downtown Sioux Falls. These same old policies could use a breath of fresh air and some new and progressive ideas. The mayor says he doesn't want to hear "this is the way we have always done it." Well, mayor, let's do something about this. It fits right into your economic development agenda for the downtown area. People are constantly complaining about parking in downtown Sioux Falls and it's because everybody wants to park at a meter in front of the store of their choice instead of a parking lot or the ramp. Heaven forbid that someone walks a short distance to get to their storefront of choice. Look at how far they have walk once they get into a mall? People in this town are afraid of parking ramps. Shawn Cable of KSFY calls this area "metro" but let's call it what it is - a big town with a small town mentality. All these people who denigrate the downtown and say its for yuppies obviously never go down there. To them I say open your minds and go on an adventure. You don't have to buy something downtown. Go for a walk downtown and take in Sculpture Walk. I wish people would open their minds to new ideas and a new scenario. There is more to this town than the two Walmarts. Authority to approve city contracts is not the business of the city council as evidenced by city ordinance 34- 1/2-1. That ordinance section says the mayor or a person designated in writing by the mayor is authorized to sign all contracts and agreements on behalf of the city and that the signature of the mayor shall be attested by the city clerk. ..I suppose the council could change the ordinance authority to them but why? The city charter says the city council shall act as a part-time policy making and legislative body, avoiding management and administrative issues. The executive and administrative powers shall be vested in the mayor. City contract administration is clearly a management and administrative issue. City Ordinance 2-35 says the mayor, by executive order, shall have the power to prescribe such administrative rules and regulations as the mayor deems necessary or expedient for the conduct of departments...subject to his authority....and that these executive orders are filed with the city clerk. Executive orders clearly set out contract administration under the mayor. It seems clear to me, at least, that contract authority and administration rests with the mayor and his administration. To pursue changing this process so the council can approve city contracts is not good business sense and will certainly bog down the business of the city. The mayor, by city charter, is the chief executive officer and runs the day to day operation of the city. The council may not like this mayor or how he does business, but the fact remains that the city charter clearly sets out the authority of the mayor. Day to day business cannot be bogged down by legislative oversight of the council. Nothing will get done in a timely manner. At some point, the city council has to trust the mayor, the city directors and mid managers to prudently run the daily affairs of city government. City Charter sets out the mayor's authority whether the council likes it or not. Contracts may have been listed in the city council agenda back in the 90's but back then it was a new form of government and everyone was feeling their way around how to to govern under the home rule charter. Sometimes too much information in the council agenda takes away from the important information that actually requires the attention of the city council besides making the council meeting a marathon session beyond what it already can be. If the council is interested in the information, my advice is to sit down with the mayor and the administration and talk about what you are interested in and why and come to some agreement how that information can be furnished to the council on an information basis. Getting involved in the day to day administration of city government is not the role of the city council.There are plenty of responsible, competent people in the adminsitration who clearly understand their fiscal responsibility to the taxpayers. Let the mayor and his staff do their jobs. I am actually intrigued by the appointment of Costello to the new Executive Committee created by the Governor-Elect. His actual work experience, entrepreneurial background and his CPA credentials make him an interesting selection for this government job. I worked with Pat when he was a city councilor. He was passionate about his opinions and fiscally very conservative. It will be interesting to watch his progress on state economic development issues. I have some questions about these new executive committee appointments. Are these new positions full time jobs? Will Pat and the other appointments move to Pierre? What are the annual salaries of these new super cabinet positions? Are they eligible to get state benefits and state pensions? Super cabinet and regular cabinet positions. State government is growing at the executive level, no doubt about it. Interesting considering the budget problems.